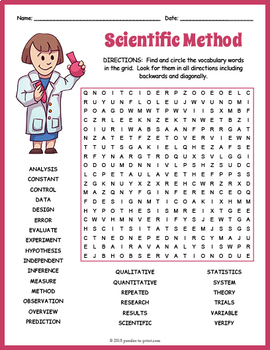 Your students will enjoy looking for all of the scientific method vocabulary words hidden in this puzzle worksheet. The words are hidden in all directions and there may be some overlaps making this a challenging word search. A great activity for early finishers or just for something fun to take home and enjoy. The worksheet comes in two versions, depending on your needs. One is in color and the other in black outline (giving kids a chance to do a little coloring if they wish and saving on printing costs). The 29 hidden vocabulary words are: analysis, constant, control, data, dependent, design, error, evaluate, experiment, hypothesis, independent, inference, measure, method, observation, overview, prediction, qualitative, quantitative, repeated, research, results, scientific, statistics, system, theory, trials, variable, and verify. If you like this wordsearch, be sure to have a look at our large collection of Science Puzzle Worksheets.